Sewing as a hobby is great, but it is more than just a hobby. It is a skill that everyone, boys, girls, men, and women should have at least a nodding acquaintance with. Everyone loses a button sometimes.Everyone has a seam come loose sometimes. If you have money coming out your ears, you can throw the garment away and purchase a new one. Unfortunately, most of us don't have money trees. Learning the basics of sewing gives the ability to maintain a wardrobe and extend the useful life of your garments. There are several ways to learn to sew. You can ask a friend or relative to teach you. You can purchase a 'how to sew' book. You can even watch YouTube videos that will cover most of what you need to know. However, you need first to have the necessary tools. While hand sewing is a valid method of sewing, it takes time and even more skill to do this well than to use a sewing machine. For that reason, a sewing machine is pretty much standard equipment. You can purchase a used machine or a new machine. Whichever you choose, purchase the best machine you can for the money you have to spend. Just be aware that purchasing a used sewing machine is like purchasing a used car. You never know how well it has been maintained and what might be wrong with it. It is well worth the effort to take up sewing as a hobby. Sewing as a hobby is one of the more practical hobbies you can take up. After all, you might get exercise golfing or hiking, but you won't have a new purse or jacket when you get through. 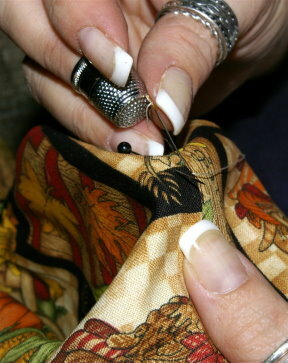 Sewing is a good skill to learn, because it can extend the life of your clothes. A quick stitch here or there will save a seam that is ripping out. At the price of store bought clothes, it is incredible that they don't usually last more than a season or two. I have skirts in my closet that I stitched up more than 10 years ago, and they still look like new. When sewing, you have a choice of the fabric you use, the pattern or style of the garment, and even how the seams are finished. For instance, you can do a French seam that encloses all unfinished edges, use a serger to overstitch them, or just pink them with pinking shears. These choices mean that your garment is truly one of a kind, made just for you. Sewing is not cheap, by any means. Now that most, if not all, the fabric mills in this country have closed down, it is more expensive to buy quality material. That said, clothes made with sturdy home-sewn seams and quality fabric can last for years. I use this machine while my embroidery machine is embroidering motifs on my projects. It never fails that I want to keep sewing, and without a second machine, I can't do that if I am using the embroidery unit at the time. This machine is heavy duty, and is heavy enough with its metal frame that it does not jitterbug across the table when sewing at high speeds. Whichever sewing machine you choose, make sure it will do at the least a zigzag stitch and a back stitch, as well as your basic straight stitch. Look for one with an assortment of presser feet, too. Nothing is more unpleasant than trying to insert a zipper with a regular sewing foot. For me, it is important that a sewing machine has a built-in button-hole function. Otherwise, my button-holes all come out different sizes! Almost everyone has a favorite brand of sewing machine. Mine was always a Singer, until I used a Bernina. Now I have both a Bernina machine and a Singer machine. To keep my Singer machine clean and dust free, I use this hard carrying case! It's great. The one complaint I have about my Bernina is that the cover is not sealed, so I have to be careful where I store the machine. If the Bernina would fit, I would have one of these for that machine, too. Otherwise dust gets into it and it has to be cleaned before use. With this hard carrying case, my Singer never gets dusty and is ready for use right out of the case. After the sewing machine, your most used sewing hobby tools will be your sewing shears or scissors (which should NEVER be used for anything but fabric), straight pins, measuring tape, sewing machine needles, and hand sewing needles. In addition, for each project, you will need a pattern or instructions, fabric, thread, and any other notions needed, such as a zipper or binding lace. If you purchase a commercial pattern by McCall's Pattern Company or Simplicity, the notions you need will be listed on the back of the pattern as well as fabric requirements. See the video below. Your sewing supplies will also need to include a measuring tape, seam ripper, pin cushion, and something to keep them all in. You will also need an iron and ironing board. Be Sure to Read the Pattern! Don't neglect reading the pattern you purchase. There are some excellent teaching points on almost every pattern you purchase. The instruction sheet(s) will walk you through cutting and sewing the pattern. As you sew, you should always keep the instruction sheets handy. One good hands-free method of keeping instruction sheets where you can see them is to tack them to the wall next to the sewing machine. If you can't put tacks in the wall, consider purchasing a cork bulletin board and installing it where you can see it from the sewing table. One woman has her sewing machine table set up in front of a window. She pins her pattern instructions to the curtain, so that she can easily refer to the instructions as needed. Even if you don't intend to make your own clothes, accessories, or household items such as curtains, knowing how to sew is a vital skill. These Fiskar scissors work for left- or right-handers. They were awarded the Arthritis Foundation Ease-of-Use Commendation for the design, because people with arthritis and limited hand strength can use them easily. The spring action opens the blades after each cut, which also reduces the hand fatigue that you sometimes experience when cutting out a pattern that has many pieces. Using the orange button, you can lock the scissors in a closed position so that there is less likelihood of hurting yourself. As for quality, I've had mine for years and keep them hidden so no one else will use them. They are still sharp enough to cut even the heaviest denim, corduroy fabric, or even leather! And if someone in the house (kids, for instance) does get hold of them and cut paper, these shears can be sharpened using the Fiskars sharpener, which I also highly recommend! Can you sew? If not, have you considered learning to sew? Part of me wants to give up, but the rest of me still tries to learn. Thanks for some great resources that might help my "condition". Other resources include your county extention office. 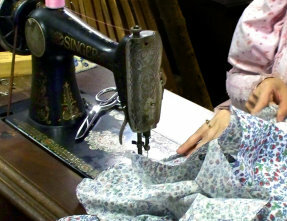 Many of them have sewing classes available. Thank you for commenting.